FESTIVAL TICKETS NOW AVAILABLE FOR PURCHASE! Hello to all. Summer has ended and we now appear to be heading towards some cooler weather. The restoration team have put in a mighty effort during the summer months and endured some very hot days. A few points to update you on our past and future activities. • Our Rathmines Anzac Day Service will commence with a march to the Memorial at 1200 and the commemorative service will begin at 1230. I look forward to seeing you there on April 25th. • The engine and tailplane were delivered to our storage site on Tuesday, March 12th. Several of the restoration team gave their time to assist with the unloading and we have thanked the RAAF personnel and Centennial Coal staff for their support. • Our Base Tours are gaining awareness and enquiry is continuing to grow. A group from Asquith Probus enjoyed a tour recently and they followed on with a visit to the aircraft. In January, a group of 35 men and women from RAAF Williamtown booked in for a tour and also a visit to the aircraft. This visit has been the trigger for ongoing discussions about our restoration, but has extended to the RAAF Centenary in 2021 and event / celebration planning. We are in discussion with Air Force staff and Council about the inclusion of Rathmines Park and the RCA in their ‘AF 2021’ event planning. • Festival organisation is continuing and there are some exciting developments. Since the December newsletter we have a new ‘Silver’ sponsor. Macquarie Manufacturing made contact in January and are now a major sponsor for the 2019 Festival, based at Rathmines …we welcome their support. In recent weeks agreement has been reached with the Paspaley Group (Paspaley Pearling Company) to have one of their Grumman Mallards fly from Darwin to Rathmines. The flight to and from Darwin is a charter operation and all of the passenger seats are fully booked. On Saturday May 18th and Sunday 19th, joy flights are still available to the public, with the seat cost is just $200. A very unique opportunity to experience a brief sea plane flight, including a takeoff and landing on the lake. More information will be posted on our website and social media. • The State election on Saturday March 23rd will see us outside Woolworths at Toronto running a sausage sizzle. Should this newsletter reach you in time, please come along and say hello. Bookings will open on Monday 11 February! 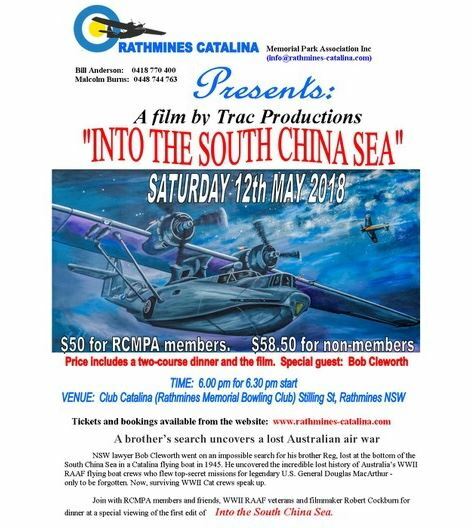 The cost will be $200 per seat for an amazing amphibious flight experience commencing at, and returning to the historic Rathmines hard stand via the WWII flying boat ramp. The flights will take place on Saturday and Sunday 18 and 19 May. Most important item for this newsletter is to wish all our members and followers a very Merry Christmas and an exciting 2019. Your support is appreciated by myself, the RCA committee and restoration team. The end of the year is upon us and it is timely to look back at the highlights and achievements of 2018 and to look forward to 2019. • A welcome to the new members who have signed on this year, many are keen to keep abreast of the restoration and several have pitched in to become hands-on at the aircraft. • Our work days of Saturday, Monday and Wednesday are well attended and you are most welcome to pay us a visit. Please contact me first. The boys will finish up on Wednesday the 19th and return January 7th. The restoration lunch table has become something of a culinary challenge…see the photos! • Great progress has been made on the centre wing section and the fuselage, plenty more to do! Terry Fahey will report on progress at the aircraft. • The AGM in July was well attended with the committee being re-elected and I thank them for all the time they offer to facilitate our goals. • The memorial garden has had a re plant, looks lovely and should be a picture by next April. Some of you may not be aware that some plants were dug up and removed…what can I say. • Festival planning is in full swing. Response to our sponsorship requests was encouraging and the major sponsors for Festival 2019 are: Centennial Coal, LMCC, Kennards Hire, Origin Energy, Newcastle Machinery Sales, Fly Pelican and Pumps 2000. There is always a need for volunteers leading up to and at the Festival…please make contact if you can spare some time. There will be a VIP marquee for our sponsors, if any member has an RSA qualification I would like to hear from you. • The dialogue with LMCC staff and Councillors continues and there have been numerous positive meetings as they work through the development of the Rathmines Park Management Plan. It does seem like slow going at times but I know that Council staff want to get it right and we will support them in achieving a vibrant outcome. • 2019 will be an important year. Records indicate that RAAF Rathmines was established in 1939….80 years next year! I would hope that 2019 will see the Park plan released and the future of ‘Our Girl’ secured within that plan. The RATHMINES CATALINA FESTIVAL Exhibitors' Expression of Interest form is now available for download HERE. Please note that this form is due in mid November! Our Annual General Meeting was held at Rathmines Bowling Club on 21 August, and was very well attended. Apart from the business conducted, it was a great opportunity to meet fellow members and socialise. I would like to thank outgoing Committee Member Graeme Hooper for his service. Two new Committee Members were elected: I welcome Terry Woolard and Warwick Fairweather to the committee. Thanks also to all who attended the AGM. The Association recently lodged a submission in response to LMCC’s Draft Rathmines Park Conservation Managent Plan. We hope that the RCA suggestions will be incorporated into the final CMP report. Preparations for the 2019 Rathmines Catalina Festival are well underway. Please remind your friends and family that the next Festival will be held on 19 May 2019. This was held at the Rathmines Bowling Club in mid-May with over 60 attendees. An excellent night, good company and food. Our thanks to caterers Lisa and Daryl. We will arrange other similar events in the coming months.